​ Olaf I Tryggvason was a bold leader of Vikings. He lived from approx. 960-1000AD, becoming King of Norway in 995. He unified much of Norway and Denmark, and also brought Christianity to the nation. He had in his possession a magical device, a sunstone, which aided him in his endeavors according to the Sagas of St Olaf. He like so many Vikings that came after him were able to traverse thousands of miles of open ocean in way that modern science was not able to completely understand. The evidence of their achievements is overwhelming, however the methods they used were shrouded in mystery. Sun-compasses, Shadow Boards, Currents and dead reckoning were all thought to be possibilities. 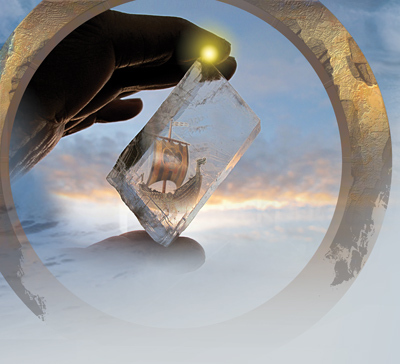 There was a more fantastical option as well, the Magical Viking Sunstone. ​ Many have thought the myth of the sunstone was just another legend. It was a magical device that allowed the possessor to know the location of the sun, no matter how cloudy the sky was. The stone could also tell where the sun was during the twilight periods after the sun have officially set. In conjunction with a shadow board, you could tell which way was north. The Sunstone would be a truly powerful device in a time before magnetic compasses were invented. Doubly valuable to a nation of seafaring warriors sailing vast distances in the often cloud covered North Sea. ​ Modern Science dismissed such as mere legends, of course. Right up until they discovered one in a shipwreck. The ship was the Alderney, an Elizabethian warship that sank in 1592. Although she sailed well beyond the times of the Vikings she did sail in the time before all the vagrancies of magnetic navigation were figured out. 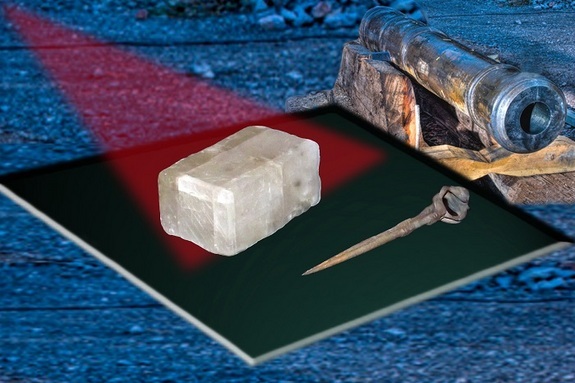 The Sunstone was found with the Navigation equipment, and is believed to been used to correct or back up the magnetic navigation devices. Although the sands and chemical reactions had clouded the Sunstone, they were able to determine that it was a piece of Icelandic Spar. One of the optical properties of Icelandic Spar is it actually doubles the objects passing through it. If you place a dot on the one side of the stone, you will see two dots on the other side. The Human Eye has a fine tuned ability to distinguish between shades of contrast. This allows the bearer to rotate the Icelandic Spar until the two points have the same intensity of light or darkness. When that is achieved the upwards facing surface indicates the direction and angle of the sun. This allows a precision within a few degrees, even under dark twilight conditions. 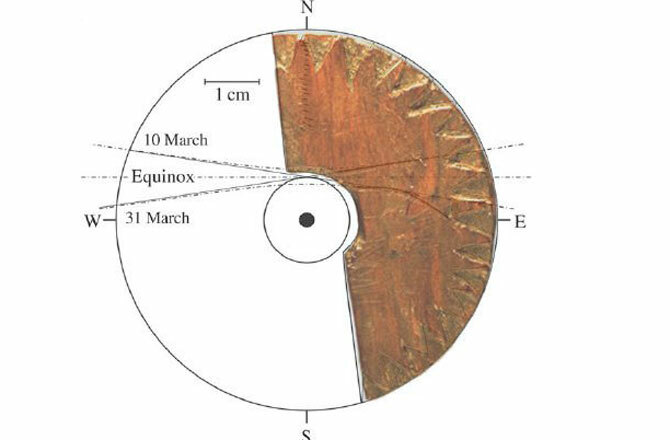 When used in conjunction with a shadow board, you are able to tell the compass direction and some hypothesize latitude as well. Such a shadow board was partially found in Greenland in 1948. ​ This Magical effect was put to the test by various scientific bodies, researchers and even TV Shows. Much to everyone surprise the Sunstone actually work. Those scholars who dismissed the existence or possibility of Sunstones were proven wrong. Of course, they had to come up with a term called De-polarizing to describe the “Magic”, but we at the Nightwatch Paranormal will give them a break on this point.